I bought Marbles and listened to it over and over and over again. And I bought the “Marbles on the Road” DVD, and watched it… a lot. But still I didn’t know Ocean Cloud. And later, when I was living on Long Island, close to the ocean, overlooking the Great South Bay, and experiencing just about all you can of the ocean’s moods without actually being on it, I still didn't know Ocean Cloud. And yet it was on my favourite, most-played album. Not really. The retail version of Marbles that was ongeneral release in the USA is one CD which contains X tracks. The version on sale in the UK (Europe?) is two CDs and X tracks. Ocean Cloud was one of those omitted on the USA version. And on the copy I bought. I know that I realised I was missing something, on or just before 6th April 2010, because that’s when I ordered the 2-CD version from Racket Records. And even though I listened to this new, longer Marbles, it many times, it was still the original-to-me version of Marbles, songs-missing, that was on repeat in my truck or on my iPod. It’s funny how some things stick. Sometimes the brain just saves up a treat for a time when you need it more. And then, I was lucky enough to see Marillion live during their 2012 North America tour. Towards the end of the show, h asked the audience to vote: Ocean Cloud, or This Strange Engine? Me, I was yelling for This Strange Engine… and that was what they played. But… why was that my preference? And was it really because I liked Strange Engine better, or just because it was more familiar? I had to find out. And since June 29th, the double-CD version of Marbles has been in my truck and playing on iPod. And Ocean Cloud has been on repeat, as I spend a long, long time cataloguing photos from three-and-a-half years on Long Island. It is an incredibly-beautiful, and moving, piece of music. (One of the reasons I love Marillion is the sheer depth of their music: not only the sounds, but the stories behind the sounds. Ocean Cloud is inspired by Donald Allum, who rowed across the Atlantic Ocean. Several times. He rowed, there and back. That’s a long way. That’s a lot of water, of waves, of storms, of clouds, of seabirds and seagulls and becalmings. What an inspiring and irrational and heroic man. And how totally alone. How much time he had for thinking… and how much time of zen no-mind-no-thought, when battling his body and the ocean’s will. That’s the essence of Ocean Cloud. 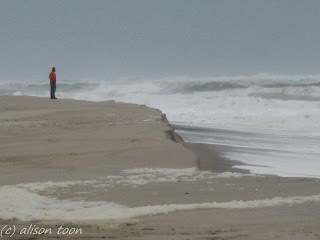 On Long Island, I had a lot of alone-ness to deal with, too. I like being alone; I don’t much like lonely. And while I found some of the best friends ever, it was a solitary and isolated and borderline-lonely existence much of the time. I lived in a beautiful place; I was close to Jade, who still lives in Brooklyn; but after Karli moved back to California, there was loneliness creeping into the edges of Alone. I think of it as a three-and-a-half year working-holiday-at-the-sea. But some days, other than work phone-conversations, the only person I talked to was my GPS fake-Bristish voice, when I argued about which way was the right way to go. Sad really. Would you row across an ocean? It takes more than physical strength. I truly believe that you can become physically able to do something that might seem impossible, if you have the mental will to do so, and spend time and effort training and preparing. And I believe that that the difference between mental health, and the lack of it, is knowing your own mental and spiritual limitations. I pushed against my own limits in a nor’easter storm that ripped the roof of the house, isolated by deep-flooded and wave-washed streets and 80-or-so mph winds, with no electricity or music and only a scaredy-dog and a feisty-cat for company. We watched the neighbour’s houses suffering similar fates, and they watched mine, imprisoned in our moated, damaged homes. None of us could do a thing to stop it. At that point, you can either choose to laugh about it and sing to the animals, or you can crack up. Me, I sing to the pets. And we were on dry land. Not tossed from wave-to-wave in a tiny boat, no engine. That’s nature. That’s the ocean. I do not think I could row across an ocean. When I listen to Ocean Cloud now, it’s not only the music, but the strength of human will, and the power of nature, that surfs into the room. 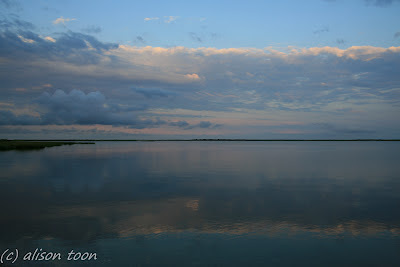 I’ve had Ocean Cloud on repeat, and playing in my head, as I work through my collection of Long Island photos. It’s a beautiful, moving, scary and powerful song. The (still-growing) collection of photos is here: this set is dedicated to Ocean Cloud. More will be added as I work my way through far-too-many untagged images. I moved back to California; better for work, and a much-less-isolated environment. I do sometimes miss "alone". I do not for a second miss lonely. H: next time you ask, I’ll choose Ocean Cloud.